Rating: 6.4/10. From 22 votes. 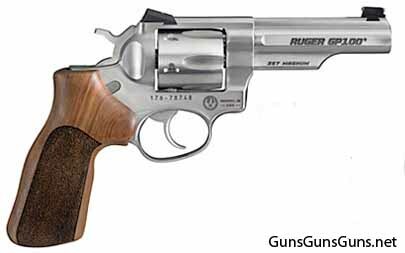 Summary: The description, specs, photos, pricing and user ratings for the Ruger GP100 Match Champion revolver. The GP100 Match Champion from the right. Hogue hardwood grips with stippled sides. Ruger says the integrated assemblies don’t require special tools for takedown. Note: Ruger offers other GP100 models as well, including the standard GP100 and the GP100 Wiley Clapp. .357 Mag, .38 Special 6 4.2″ 9.5″ 38 oz. The GP100 Match Champion from the left. This entry was posted in .357 Magnum, .38 Special, .38 Special +P, $751-$1,000, Full size, Revolver, Ruger on January 15, 2014 by Staff.